Ever wondered how some celebs manage to maintain their radiant glows? While many stars are just genetically superior (we're looking at you, Gisele), others have beauty tricks up their sleeves that keep them looking fresh-faced and red carpet ready all year long. 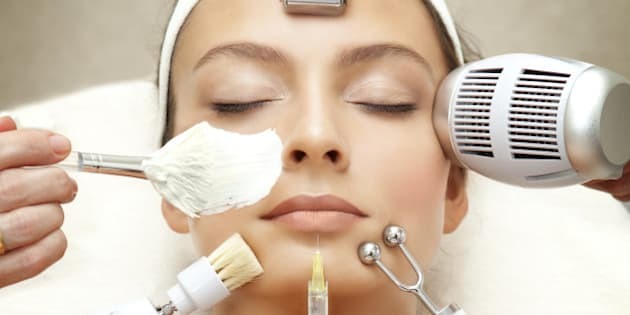 Having buckets of money to spend at the dermatologist's office definitely helps, but some celebrity beauty routines are deceptively simple. We've compiled a list of diverse steal-worthy secrets from the world's most radiant stars, so you'll never have to endure another dull skin day again. And don't worry -- we're not just going to tell you to drink more water. The new mum isn't just glowing with pride. Before her wedding to Prince William, Middleton reportedly got a bee venom facial for a smoother, more youthful complexion. Surprisingly, bee venom isn't reserved just for royal skin: commoners can get in on the trend, too, with their own jar of venom-laced cream that won't sting the wallet too much. It's no surprise that Nicole Kidman swears by sunscreen to maintain her enviably porcelain complexion, but she's certainly not alone. Sun-kissed Colombian superstar Shakira religiously applies baby sunblock to protect her perfect skin. With a hunky husband (The Office’s John Krasinski) and a smokin' hot career, Blunt has a lot to be glowing about. That doesn't mean she doesn't have a little help, too. Her facialist told Harper's Bazaar she uses antioxidants like resveratrol to help Blunt maintain her radiant skin. People can't stop talking about how amazing Aniston looks for her age. And with good reason: the 44-year-old actress doesn't look a day over 35. To combat dreaded crow's feet, Aniston reportedly slathers Vaseline under her eyes each night before hitting the sack. You'd be forgiven for wondering what Parker's secret is. At 49, the eternally youthful actress boasts radiant, wrinkle-free skin that a lot of 25-year-olds would kill for. While she chalks some of it up to good genes, she admits she has a little help from a regenerating serum by Dr. Hauschka. The ageless Mrs. Brolin reportedly indulges in cosmetic acupuncture to maintain her youthful complexion. And she's not the only one: it's rumored that Madonna, Gwyneth Paltrow, and even Prince William have also gone under the needle to help firm up saggy skin and get rid of unsightly under-eye bags. Clearly, age is just a number for Berry, who's pregnant with her second child at age 46. With her famously buff bod and glowing skin, it's easy to forget that the former Bond girl is well into middle age. She credits vitamin C with helping her maintain her perfect complexion: she reportedly rubs it directly into her skin. Many Real Housewives of Beverly Hills fans were freaked out by the electrical facial Richards got on the show. During the procedure, she looked a little more Hannibal Lecter than radiant starlet. But with results like hers, it's easy to see why she endures it. The procedure uses an electrical current to zap solution directly into her skin. There's a reason why the supermodel always looks so fresh-faced, dewy-eyed and alert: she rubs lip balm around her eyes to create a shimmery glow. If you’re going to try this trick at home, be sure to use balm and not gloss -- experts caution that sticky gloss could clog pores. For a more long-term solution, consider a product like Garnier’s Skin Renew Dark Spot Treatment Mask. The beautiful French actress reportedly swears by argan oil, a secret Moroccans have been in on for centuries and the rest of the world is starting to catch up on. It's packed with antioxidants that help improve elasticity and contribute to Cotillard's natural-looking glow.